There's no denying Kanye West is a powerful force in fashion. Besides being ridiculously well-dressed and a front-row regular, he's got legit design credit under his belt, thanks to his capsule collection with A.P.C. and upcoming footwear line with Adidas. The rapper does not shy away from proclaiming his love for the fashion industry; in fact, he's stated on many occasions that he'd rather design and spend time with the sartorial elite in Paris than focus just on music, and really, really wants to be taken seriously in that regard by the top order (Hedi Slimane, Anna Wintour, Pheobe Philo, you name it). Just this week, rumours began swirling that West is planning to leave music behind altogether to concentrate on fashion endeavours. Because I happen to be two things—both a fashion obsessive and unabashedly one of Kanye's biggest fans out there—I put together a list of the best things he’s ever said (or rapped) related to fashion. Keep reading for a mix of hilarious, clever, insane and sometimes insightful fashion words courtesy of the one and only Mr. West. Kanye West in his BBC interview with Zane Lowe. Kanye West on inventing the leather jogging pant, in his BBC interview with Zane Lowe. 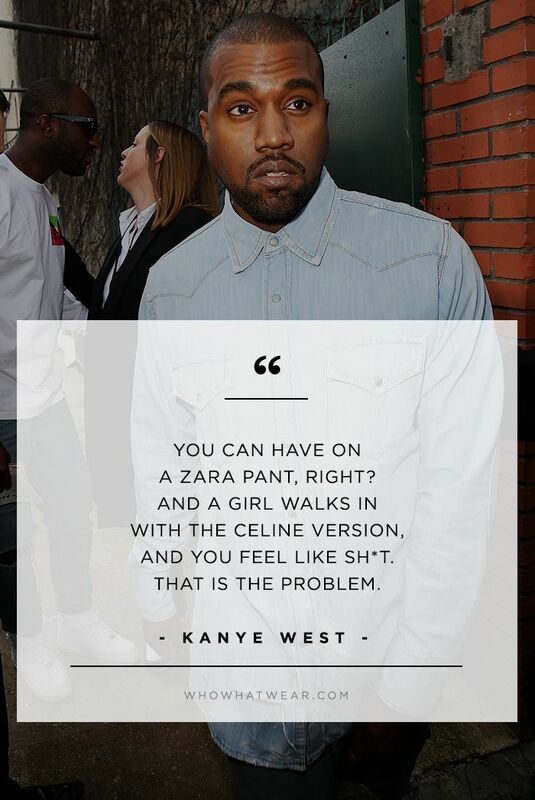 Kanye West on haters hating on his fashion design chops from his BBC interview with Zane Lowe. —Lyric from "Can't Tell me Nothin'." —Lyric from "N****** in Paris." —Kanye West on his longstanding love of men's footwear, in his BBC interview with Zane Lowe. —Lyric from "Devil in a New Dress." —Kanye West on his song, "New Slaves," and being a slave to fashion, in his BBC interview with Zane Lowe. What's your favourite Kanye West quote of all time? Sound off below.